It seems only fitting that our latest product review is something specifically for the homeschool mom in your life and just in time for Mother’s Day. I recently had a chance to read a copy of The Busy Homeschool Mom’s Guide to Daylight written by Heidi St. John and published by Real Life Press. Being Intentional which addresses why we even need to have a plan to get it all done. 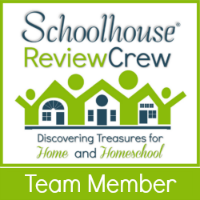 Being Organized not just in your homeschool, but in your home. Is clutter and disorganization rendering you ineffective? Being Prepared to feed the hungry among you. Great tips on ways to feed the hungry tribe both during and after your schoolday. The Busy Homeschool Mom’s Guide to Daylight is a total of 195 pages of insights, tips, and encouragement. This text comes in both digital download as well as a paperback physical copy. 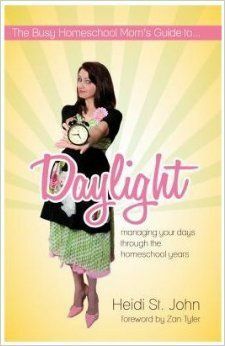 The Busy Homeschool Mom’s Guide to Daylight is a wonderful resource no matter where you are in your homeschool journey. It didn’t really matter what chapter I was on, it felt that like Heidi St. John and I were sitting around the kitchen table chatting. So many of the topics in this book are so applicable to just about every homeschool family I have met. As a matter of fact, a lot of the topics presented have a way of getting worse with homeschooling. I have often wondered how my mom had so much time to visit shut-ins from our church, always have a homemade meal on the table right on time, a clean house that felt livable, and time in the evenings to help us with homework. It was in looking back that I realized it was because we were in school all day. In accepting the fact that I have a full-time job called “Educator” to my children, it is now understandable why my house and life do not match what I remember of my mom. A critical factor is not only do I not have all those hours available, but I have four people here all day with me that contribute to messes and make demands on my schedule and organizational skills. There was a time in my life that I did work full-time while having children. I did a much better job of planning and organizing. I attribute this to the fact that when I got dressed and left home for work it felt like a real job. Many of the things that I was doing right then, I have not readopted since homeschooling our children until my eyes were opened to treating my job as homeschool mom as a real job. The Busy Homeschool Mom’s Guide to Daylight was a real call to action to evaluate where we are, prioritize our goals, and figure out our own plan of action that will recapture those organizational tips and changes that will make our home run more smoothly while homeschooling. Intentionally planning at least 2 days a week where we go no where. This has been a tough one with two teens working outside the home and another teen gearing up for basketball summer training. Inspiration into new ways of using a crock pot and slow cooker to my advantage in getting dinner on the table at a reasonable hour. The corkscrew path to success and principle of mastering our family schedule rather than letting the schedule be our task master. Be conscious of just where my time is going. Social media, internet browsing, and even text conversations can be such time monsters and become greedier by the day. The Busy Homeschool Mom’s Guide to Daylight really focuses on managing your home and homeschool. We mustn’t forget that we are simultaneously managing our marriages. You will want to check out some of the other reviews by clicking on the graphic below to learn more about Real Life Press’ other release, The Busy Homeschool Mom’s Guide to Romance. Additionally, some Crew members also did reviews on the Firmly Planted Bible Studies published by this same company. I have thoroughly enjoyed reading through The Busy Homeschool Mom’s Guide to Daylight and would encourage you to check it out.